The Highest grossing Godzilla film in Japan and… both monster’s debut in color! Opening on August 11th, 1962, Kingu Kongu tai Gojira was a tremendous hit in Japan. Oddly enough… this controversial Japanese movie actually had it’s start in the United States. Willis O’Brien, the lesser known stop motion SFX pioneer and mentor to Ray Harryhausen , penned the original script called ‘King Kong vs Frankenstein’. Unable to get financing and unhappy with his treatment in Hollywood , O’Brien takes the storied script to Tokyo. TOHO studios decides to produce the project, with a big change…King Kong will duke it out with Japan’s own Gojira! RKO studios supplies the rights to KK and the legendary film is born. The ultimate Kaiju Eiga (monster movie) team of Ishiro Honda and Eiji Tsuburaya take on the Directing and SFX duties respectively. Honda’s filmed vision of the movie employs a more tongue in cheek and humorous tone meant for the Japanese audience…humor in which critics and studio heads in the U.S. don’t quite get. For the release in the States, most of the humorous bits are cut and filled in with ‘newsreel’ footage of the two monster’s path of destruction. The U.S. version ultimately fails miserably. Horrible plot holes, ruined pacing, and poor editing, massacres the film shown for the American audience. I feel that the American studio execs and critics of the film didn’t quite get what they expected and definitely took the film too seriously…the laughably horrible Kong suit in the film didn’t help matters. Honda and Tsuburaya’s King Kong vs Godzilla was meant to be a more ‘fun for all ages’ monster movie. With the film’s major success in Japan, the Godzilla series would see continued success using the ‘VS’ device. King Kong vs Godzilla marks TOHO’s permanent shift towards an ‘all ages’ audience, and best of all, continued to bring us all a wonderful parade of monsters! Which goliath survives this titanic clash?…You’ll have to watch this fun, action packed film to find out! 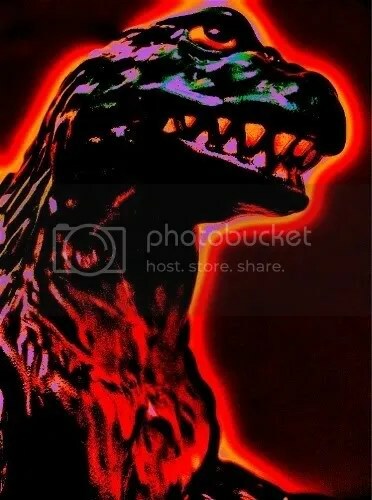 This entry was posted on July 21, 2008 at 1:18 am and is filed under The Kaiju Art Collection with tags godzilla, HDR photography, japan, Kaiju, king kong, movies, toy, ultraman, vintage. You can follow any responses to this entry through the RSS 2.0 feed. You can leave a response, or trackback from your own site.